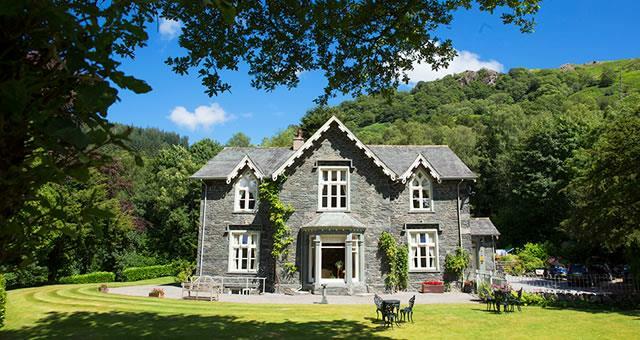 Hazel Bank Country House017687 77248work017687 77373fax Guest AccommodationAward-winning Hazel Bank, an early Victorian country house, stands secluded and peacefully amidst beautiful 4-acre gardens with breathtaking views of Great Gable and other central Lakeland fells. Recently refurbished to exacting standards. Attention to detail is second to none and housekeeping standards have achieved Gold Awards from VB. A magnificent country house set in 4 acres of Britain's most beautiful countryside. Elevated above the hamlet of Rosthwaite, with commanding views of surrounding fells (Including Scafell Pike and Great Gable). Built around 1840 it had Sir Hugh Warpole as a guest who used it as a fictional home for Rogue Herries, and birth place of Judith Pariss. A classic country house with private woodland, bridges and beck side walk. Uniquely situated for all manner of outdoor pursuits and with easy access to Keswick and Derwentwater (Queen of the English lakes). Wholesome breakfasts and dinner reflecting the taste of Cumbria. 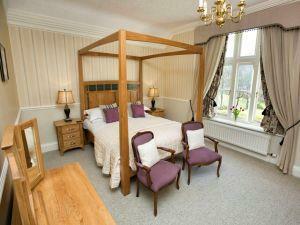 Hazel Bank Country House sometimes limits bookings to 3 or more days. Blencathra is a spacious deluxe room with views over the garden to the woodland and Watendlath fells, and is ideal for watching the numerous types of wild life we have here, from Red Squirrels, Pheasants and even Deer. Set four course Dinner is available at £29 per person when booked in advance. Blencathra sometimes limits bookings to 3 or more days. We had the best time staying here. Beautiful hotel and location. And more impotantly the most friendliest owners weve met. Made you feel at home. 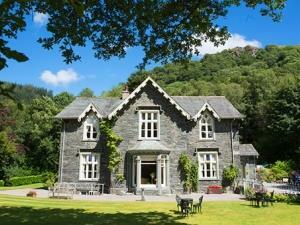 The location was fabulous in the valley of borrowdale, with so many walks to do starting from the door step. Definatlry somewhere we will go back and tell friendd about. Award-winning Hazel Bank, an early Victorian country house, stands secluded and peacefully amidst beautiful 4-acre gardens with breathtaking views of Great Gable and other central Lakeland fells. Recently refurbished to exacting standards. Attention to detail is second to none and housekeeping standards have achieved Gold Awards from VB. Ample parking and free wifi. Children welcome from age 12. From M6 jct 40 follow A66 towards Keswick. Take B5289 from Keswick signed Borrowdale. Prior to entering village of Rosthwaite turn left up signed drive over hump back bridge.